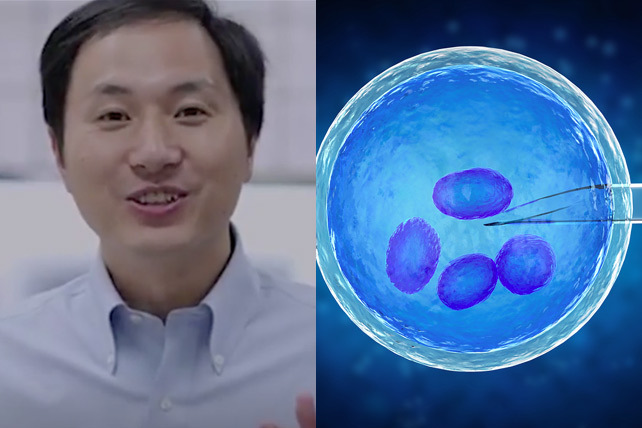 A Chinese scientist claims he has been able to “edit” the genes of human embryos to create twin girls. This claim is unprecedented and, so far, unconfirmed. He Jiankui is with the Southern University of Science and Technology in Shenzhen, China. He says he used a technique known as CRISPR, or Clustered Regularly Interspaced Short Palindromic Repeats, to make the modifications. He’s actions are controversial, first, because the results have not been peer-reviewed. Second, no one has created babies with gene-editing technology before. If He’s claims are true, it would be a “historic” event, says NPR, similar to the first baby born through in-vitro fertilization in 1978. There is also the question of whether the scientist broke any laws. A local medical ethics board is evaluating the situation to determine whether this is the case. He’s university says in a statement it is “deeply shocked” by the news and has put him on unpaid leave. He’s fellow scientists reacted with similar dismay when he addressed them about his research at the Second International Summit on Human Genome Editing in Hong Kong. Noting that there are other ways to prevent HIV infection, Doudna questioned why the team of scientists decided to tackle the virus through gene modification. Conference attendee Alta Charo, who is a bioethicist, stated that the babies were at a minimal risk of contracting HIV because it was the father who carried the virus. She describes He’s actions as pointless and off-track and says that the parents were given misinformation about the experiment. Next articleNFL, MLB Players Answer: Why Is Baptism Important?